Kate's cottage is a detached stone built cottage right on the sea shore with stunning views of the Cuillin mountain range on Skye. The cottage has a double bedroom, a twin bedroom on a mezzanine level, lounge with wood burning stove, kitchen, shower room and cosy dining porch. The beach is directly on the doorstep. A dream location for dolphin and otter spotters! The cottage is within a few minutes walking distance from the ferry terminal and less than five minutes walk from Raasay House where guests can enjoy the restaurant, bar and outdoor facilities offered. The cottage has a garden to the front of the property with table and chairs which has panoramic views of the sea and mountains. The garden behind the cottage is mainly grassed. Please note that the twin room on the mezzanine level is accessed from the lounge by a fixed wooden ladder. It is also not full height. It is therefore not suitable for very small children, however older children and many adults love it. It also has a skylight window for star gazing. A great place to escape from more crowded areas in the highlands and on Skye. The views are stunning and always new as the weather changes, but we weren't as lucky with wildlife as many of the other visitors. The cottage is exactly as described in the listing, was very clean and communication with Sandra was easy and helpful. As noted in one of the other reviews, it would be nice if there were a few more basic supplies in the kitchen. The cottage was clean and comfortable. However there is no mention of the fact that the mezzanine bedroom is accessed by a ladder, which is important when an adult is to occupy the room. A lovely cottage in a beautiful spot. If you want peace, beautiful sunsets and the chance to see wildlife on your doorstep then look no further. The cottage was everything you could want . We loved every minute of our stay in this comfortable , cosy , clean cottage with views that will stay with us for ever .The weather we had was not great but their were plenty of dry days that we enjoyed for walking and getting to know the island . The island has a single track road that travells along most of the coast and every corner brings spectacular views . We drove around the island several times and only once met another car . Sandra , the owner of the cottage was a great help with any queries and was always close at hand if we needed anything although like the cars she was rarely seen . We will definately be back...sooner the better ! Fantastic setting. peace & quiet. Amazing views. Great cottage for 2 adults. We had bright sunshine all week - not sure how it would have been if it had been cold & wet! The cottage and Location are fabulous our visit was March the cottage was very cosy with a lovely log burner to keep you warm, the sea is so close it brings wildlife right up to the doorstep with stunning views from every window, it's a place you dream about. Sandra the owner was so helpful I fell we have a new friend in Scotland, can't wait to return. 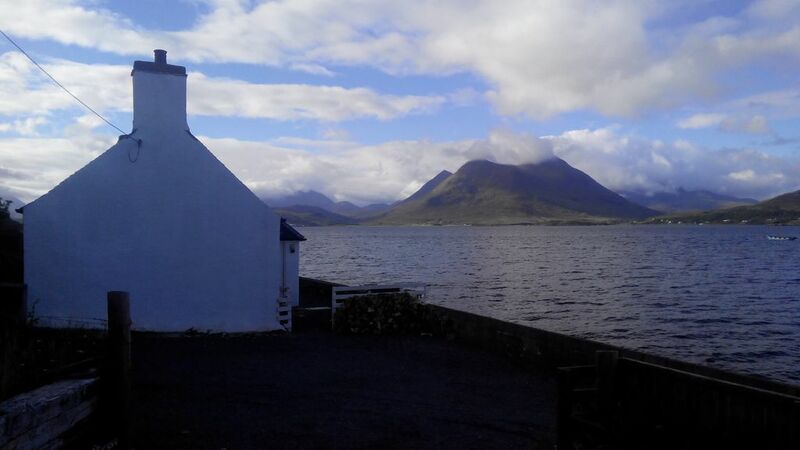 The beautiful island of Raasay is separated from the Isle of Skye by the Sound of raasay. A twenty minute ferry takes you from Sconser directly to the island and a two minute walk takes you to the holiday property. The island is truly a get away from it all experience. Calm and peaceful without the throngs of tourists that other parts of the west coast of Scotland experience. Take a walk up Dun Caan, or marvel at the deservedly famous Callum's Road or just simply sit and relax watching the otters and dolphins at play. Short breaks are available, please email for prices.